Astrology!! What to Donate for Planetary Peace ? Astronomy Donation Facts , Things Represent Different Planets, What To Donate For Planetary Peace?, Astrologer for best and perfect remedies of problems, Secrets of Daan. What to Donate for Planetary Peace ? Have you Ever realized that sometimes when you gifted or donate a specific thing you got benefit and sometimes it is also seen that after donating a thing you got loss. Astrology a great lore reveals the mystery of donation too.In Astrology it is revealed that what to donate and when. if we follow the rules of astrology definitely we will get benefit. If any planet is creating problem then and we are not able to do very expensive rituals for it then donating things of that planet will be a better options. But before proceeding for donating things horoscope must be checked. Point to remember is that there are some particular things which represent a particular planet and suppose if any planet is creating problem in that case if we are keeping the things of that planet we will be affected more by that planet as we are giving place of our enemy in our house. So to overcome this type of problem it is better to start donating the things of that planet which is creating problem in our horoscope.So astrology is very great lore, by using astrology principles we can open our way to get success. What to Donate for Which Planet ? Here i am providing you the information of things with its planets. Sun(Surya) : Ruby, Copper, gold, Cow, Red, Cloths, Ghee, kesar, Molasses(gud), gehu etc. Moon(Chandra) : Pearl, Rice, White cloths, white sandal, shankh etc. Mars(Mangal) : Coral, lentils of masoor, kesar, red cloths, molasses, copper etc. Mercury(budh) : emerald, green cloths, Elephant teeth, Tulsi, Brass utensils etc. Jupiter(guru) : Topaz, Books, yellow cloths, gold, Turmeric, gram lentils etc. Venus(shukra) : silver, Milk, diamond, perfumes, aromatic substances etc. Saturn(shani) : Iron, Black Sesame(til),urad daal, blue sapphire, kulthi, blanket, black cow, shoes, etc. Dragon Head(Rahu) : onyx(gomed), urad daal, golden snake, mustard, lead etc. Dragon Tail(ketu) : cats eye, black sesame(til), blanket, iron etc. So these are the list of some the products with it's planet. What To Feed Birds To Enhance Luck? Powerful way to minimize the impacts of malefic planets, items of daan for a hurdle free life, things to offer to get a smooth life. 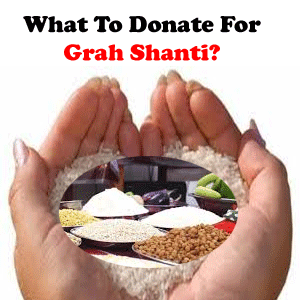 Astronomy Donation Facts , Things Represent Different Planets, What To Donate For Planetary Peace?,Astrologer for best and perfect remedies of problems, Secrets of Daan.